A fundamental assumption of the “Greenhouse” “Climate Change” theory is that the energy entering the earth from the sun is “balanced” by the energy emitted from the earth. This illusion is assisted by the assumption that all energy exchanges are by radiation, and therefore are instantaneous. Trenberth K E, J T Fasullo and J. Kiehl (2009), Earth's Global Energy Budget. Bull. Amer. Meteor. Soc., 90, 311-323. Then it goes on to admit that there are many reasons why this is not true. These include scattering and reflection of incoming radiation by clouds and aerosols, absorption by the atmosphere, transfer of absorbed heat to kinetic energy and latent heat. They also admit that energy may be stored for some time or be converted to other forms of energy. The above diagram, which assumes constant values for all the assumed energy transfers, shows a global energy imbalance of +0.9W/sqm, presumably a result of the mentioned additional disturbing factors. If their figures are realistic this means that the earth is warming without increases in greenhouse gases. A revision of this diagram, about to be launched by the Fifth Report of the IPCC, (which I am not allowed to show you) complicates this still further. They change several of their chosen figures but they now admit that the figures chosen are more or less arbitrary choices from a range of published estimates which they now add to the diagram. The overall imbalance is now slightly reduced to +0.6W/sqm, but the quoted wide ranges must mean that there is a considerable inaccuracy in this figure. It confirms that the earth is probably warming but it could be much higher than this, or even cooling instead. Changes in energy on the surface include formation of living organisms, recovery of stored energy by ,combustion of fossil fuels, nuclear energy and the energy required to alter or erode the surface by the action of wind, oceans and glaciers. Heat engines create negative entropy on their product which thereby is a storage of energy. The overall process has to comply with the Laws of Thermodynamics. The energy stored in the biosphere is partly recovered by the decay of dead organisms This is often slow and incomplete and its remains may represent recoverable energy. According to the latest IPCC estimate, the energy received on the earth’s surface from the sun is 160 Watts/sqm. If this is multiplied by the seconds in a year (3.15X107) and by the square meters on the earth’s surface (5.1 X 1014) we get 2.6 X 1024 joules per year. According to the BP Annual Review 2012 the total annual world energy consumption in 2011 was 12476.6 Million Tonnes of Oil equivalent; consisting of 4130.5 oil, 3987.1 gas, 5720 .1 coal, 791.5 Hydro, 599.3 Nuclear, 194.8 Renewables. If you separate the fossil fuels, you get 11837.7 Mtoe. Multiply by 42X 1012, it gives 5.0 x 1021 joules per annum. This is about 0.2% of the input from the sun. If all this energy was released as heat it would amount to an additional annual global imbalance of +0.32W/sqm, 20% of the supposed +1.6 W/sqm claimed to originate from greenhouse gases. As I pointed out in the similar calculations I published in my book “The Greenhouse Delusion” (2002) (currently available on Amazon/com), most of the energy is released over large industrial regions of Europe and North America, where the local input would be several times the global average and therefore close to that of the supposed greenhouse effect. World energy consumption currently increases annually by about 2.5%. In addition to energy from fossil fuels, more input comes from changes from the earth from nuclear power, geothermal, and volcanoes. Some energy would be used to erode the surface under the action of wind, sea and glaciers. 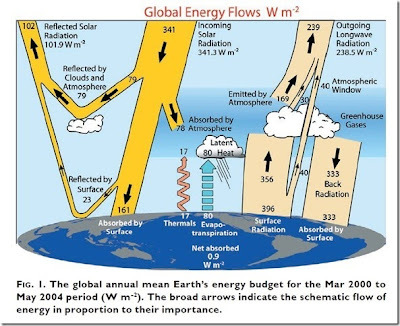 The energy imbalance of the earth is probably positive, but also extremely uncertain, so that the IPCC Climate model, as shown by Figure 1 and also by the forthcoming update, is quite incapable of giving guidance on the possible role of greenhouse gases in modifying the climate.